pojemność: 5 ampułek / ampoules x e 5ml/0,17 fl.oz. Give your hair long-term fresh and strength! 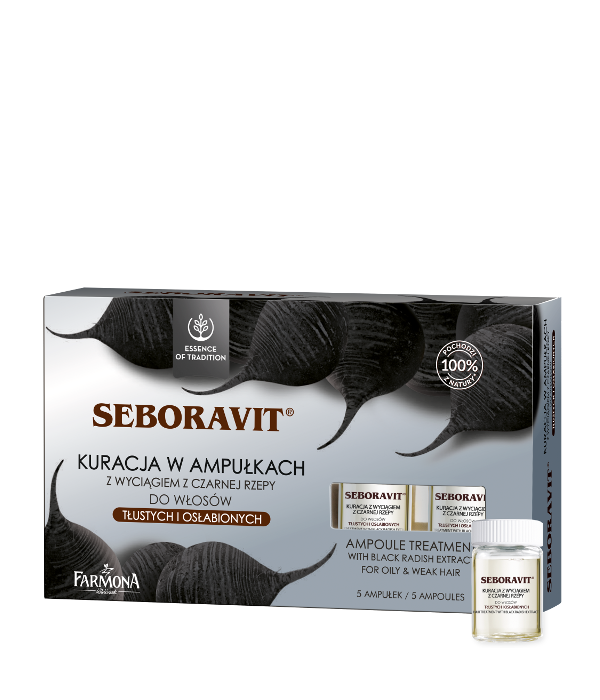 Seboravit ampoule treatment is based on a verified and effective formula. It is a result of a long tradition of using the unique properties of black radish. Apply the contents of the ampoule to the scalp and massage. Do not rinse off. Use 2times a week, until getting visible improvement in the hair condition, and then use once a week to maintain the effect. Aqua (Water), Alcohol Denat., Raphanus Sativus (Radish) Root Extract*, Niacinamide, Arctium Lappa (Burdock) Root Extract*, Acorus Calamus (Sweet Flag) Root Extract*, Propylene Glycol, Panax Ginseng Root Extract*, Panthenol, CAFFEINE, Zinc PCA, Inulin*, Allantoin, Diazolidinyl Urea, Iodopropynyl Butylcarbamate, PEG-40 Hydrogenated Castor Oil, Parfum (Fragrance), Citronellol, Hexyl Cinnamal, Butylphenyl Methylpropional.